The world is big and your kingdom small. Small when compared to the world that is; it's moderate-sized when compared to other kingdoms. But in a big world like this one - big when compared to smaller worlds anyway, if such things exist; it's moderate-sized when compared to worlds of roughly the same size, and a little small when compared to worlds just a little larger - well, to make a long story short - short when compared to longer stories anyway - it is time to stretch your borders. You've heard of far-off places - exotic countries, where they have pancakes but not waffles, where the people wear the wrong number of shirts, and don't even have a word for the look two people give each other when they each hope that the other will do something that they both want done but which neither of them wants to do. It is to these lands that you now turn your gaze. The central theme is cards that do something immediately when you buy them or gain them. 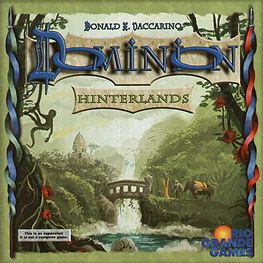 Not the best and not the worst Dominion expansion. To be honest, it's a bit bland, but I accept this isn't the consensus view. It adds cards only, not mats or tokens. I played a lot of it alongside games of 'Seaside'; initially I thought Hinterlands was better but on reflection I think it's the other way around. Hinterlands has a desert theme for the cards and their artwork (e.g. Oasis, Nomad Camp, Embassy). Many of the cards do something when first bought, distinct from the action itself. This builds in a planning aspect to the buys. We tried the 'Gambits' scenario a lot, which has the massively overpowered 'Tunnel' card in the set of ten. 'Jack of All Trades' is another overpowered card, the basis of the 'Double Jack' strategy professional players use. The 'Silk Road' card isn't overpowered per se but is a genuine game changer because the Silk Road rewards, rather than penalising, large decks. The presence of the overpowered cards does little to address the basic flaws in the Dominion system.